Is cluiche é nasc a chuideoidh le foghlaimeoirí agus daoine le Gaeilge a stór focal a mhéadú. Sa chluiche tá dhá dhísle a stiúraíonn an cluiche: nuair a chaitheann imreoir na díslí caithfear leanúint na focail a thaispeántar agus meaitseáil a dhéanamh idir téamaí ar na cártaí sé-thaobhach. Is féidir dhá chluiche éagsúil a imirt leis na díslí agus cártaí céanna. Tá sé théama d’fhocail: ainmfhocal, briathar, aidiacht, ordú, gairm bheatha agus náth. Beidh cóipeanna den chluiche seo ar fáil san fhómhair 2016 agus is féidir réamhordú a dhéanamh don chluiche anseo. Produced by www.cluiche.eu (with assistance from COGG). 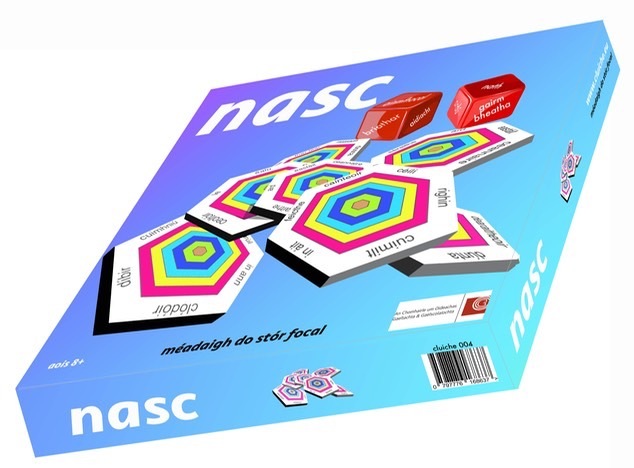 Nasc is a game which will help learners to increase their range of vocabulary. Two dice control the moves made in this game with hexagonal cards. There are six word themes in the game: nouns, adjectives, verbs, order forms, idioms and professions, and the pair of dice have these themes on their faces. The player must match the two themes shown when the dice are thrown from the edges of the cards, and attempt to make a line of seven cards in a row to win the game. A faster game can also be played using the same cards and dice, where the target of a line of seven cards is replaced by matching pairs of cards against another player.